There is so much of interest and of historical importance connected with the history of Kilwinning Crosse Lodge, No. 2-237, A. F. & A. M., that the selection of what to include and what to omit in a brief story of that historic Lodge has been something of a $64.00 question. 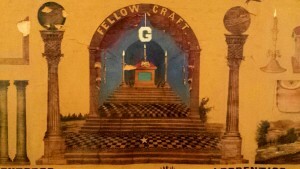 Portion of painted canvas taken from original Kilwinning Port Royal Cross lodge and housed in the current Kilwinning Crosse Lodge in Bowling Green. Those words were written in 1955 by Most Worshipful James Noah Hillman, Past Grand Master of Masons in Virginia and former president of Emory and Henry College, upon beginning his book on the history of Kilwinning Crosse Lodge No. 2-237. The history of Kilwinning Crosse is indeed intriguing, unique, and of the utmost importance to the region and to the formation of the Grand Lodge of Virginia. The resources provided on this site are for the education of the friends and brethren of Kilwinning Crosse and to help preserve the knowledge of a crucial part of our civic and masonic history. If at any point in time you have questions regarding our lodge’s history, events, or general masonic knowledge, please don’t hesitate to contact us via our contact form linked on the top of your screen. Lodge “Crash Course” – The Grand Lodge of Virginia provides amplifying information on most lodges and offers a fairly concise explanation of who Kilwinning Crosse is. Want to know who we are without diving into too much detail? This is a great place to start. From 2 to 2-237 – Kilwinning Crosse has the unique distinction of having a hyphenated number, issued by the Grand Lodge at the turn of the 20th century to honor our historical significance to Freemasonry in Virginia. Learn about the winding road that led to this unusual numerical assignment. Early Meeting Places – As with many colonial lodges, the brethren of Kilwinning Crosse have met at a variety of locations in Port Royal and Bowling Green, VA. Learn where these locations exist and how we arrived at 102 Chase Street. Jewels: Theft and Brotherly Love – The ravages of war in the 1800s resulted in the plundering of many towns in Virginia. The lodge of Kilwinning Crosse was not exempt from the effects of the Civil War. One of the more interesting stories in our lodge’s history involves the fate of our original Masonic jewels, given to the lodge from the Grand Lodge of Scotland in the 1700s. Learn what happened to these jewels and what role the virtues of brotherly love played in their return. 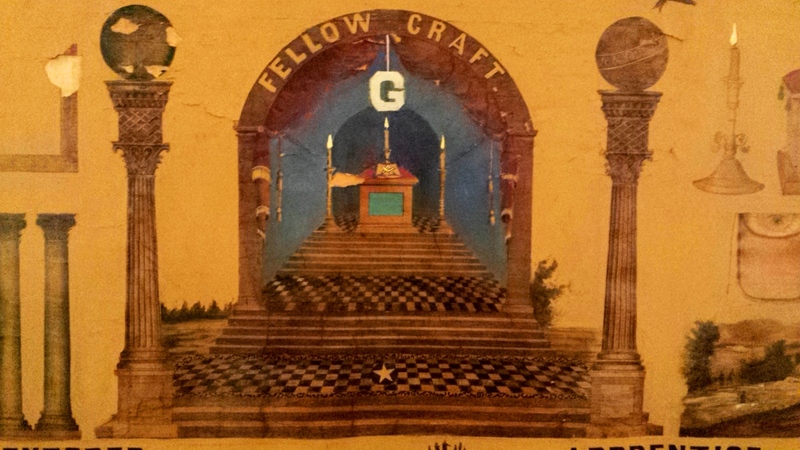 The First Master – Creating a masonic lodge is no simple task. It takes a special kind of individual to rally potential brothers and begin a new journey in masonry. Learn about the first Worshipful Master of Kilwinning Crosse. Famous Brethren – Being a lodge of considerable age, several notable individuals have been members of Kilwinning Crosse including military leaders, revolutionaries, and founders of Freemasonry in Virginia. Lodge Crossings – As an institution, Kilwinning Crosse has played significant roles in the formation of a Grand Lodge in Virginia, establishing daughter lodges, and contributing to the overall practice of Freemasonry in our community. Learn more about how the history of Kilwinning Crosse is interwoven with the histories of other masonic bodies. © 2019 Kilwinning Crosse Lodge No. 2-237. Built using WordPress and OnePage Express Theme.